Kids these days, they just don’t scare like they used to. Maybe that is a good thing. We hear that laughter is 10 times more potent than screams. And it's just not nice to scare small children. Take their candy? Yes. Scare them until they scream so loud that a canister is filled to power electricity in Monstropolis? Not cool man. Mike Wazowski, is just a young buck who wants to be like Scarer Frank McCay. He doesn’t know that laughter is more powerful than screams, not yet anyway. One day, years after he is told he will never be a Scarer, he, and his best friend Sulley will discover the power of laughter. But first he has to make it through Monsters University. And with enemies like Randall Boggs it is going to be a tough ride. 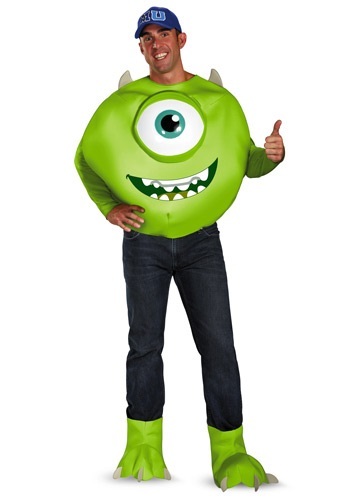 When you put on this Monsters Inc Deluxe Adult Mike Costume, get ready to feel like an awkward teen again. You'll have a contact lens as large as a pizza, and a retainer. But don't worry, with your can do attitude, and a friend like James P. Sullivan, you will be able to do anything you set your mind to. And discover a few new things along the way. Plus you will end up with the prettiest girl with snakes for hair that you have ever seen. Oh, Celia you vixen. And through your adventures you will become friends with the Abominable Snowman. So don’t worry if you get told 'you can't', because you will do amazing things.